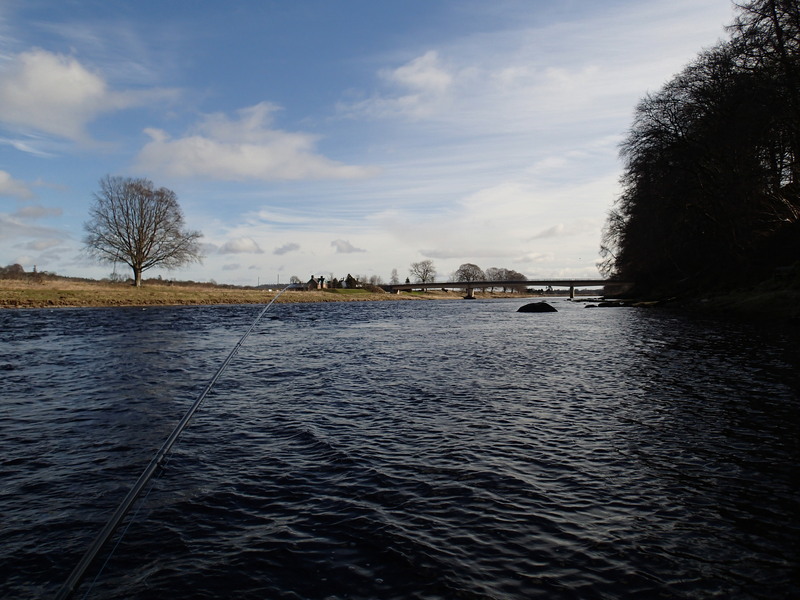 It must be 20 years since I last fished Glendelvine Beat on the middle River Tay when the late, great Davie Brown was the ghillie. Anyway, a chance invitation found me back there yesterday on Monday 23rd March. Conditions looked good enough with 1ft 9″ on the Caputh guage and a blink of sun although very few fish in the book. First thing in the morning I was sent round to fish the Boat Pool from the Murthly side. This is the pool where Georgina Ballantyne caught the British record salmon and to me, will always be a significant place. As a mark of respect and for luck, I waded out to touch the Wee Bargie Stone just below where she hooked her momentous fish. It seemed to do the trick. 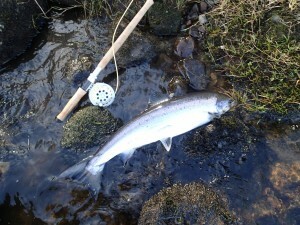 Within half an hour I had landed two springers and lost another just below the Stone. Good old Park Shrimp Conehead accounted for the fish fished off a sinking tip.It is an interesting piece of water to fish. 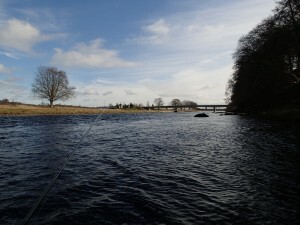 Just out from the Wee Bargie Stone, the water looked ideal for lying fish and I started off fishing a rod length and gradually lengthening my line. All three fish were hooked at about half of my normal fishing distance and goes to prove the old rule about making sure you fish the near water first. 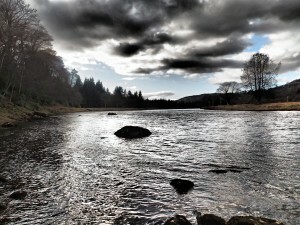 Good karma and a nice reintroduction to the Beat Hopefully, with warmer air and water temperatures coming, this will herald the start of a good run of fish as we head into April and what should be the peak period of our Scottish spring salmon fishing. 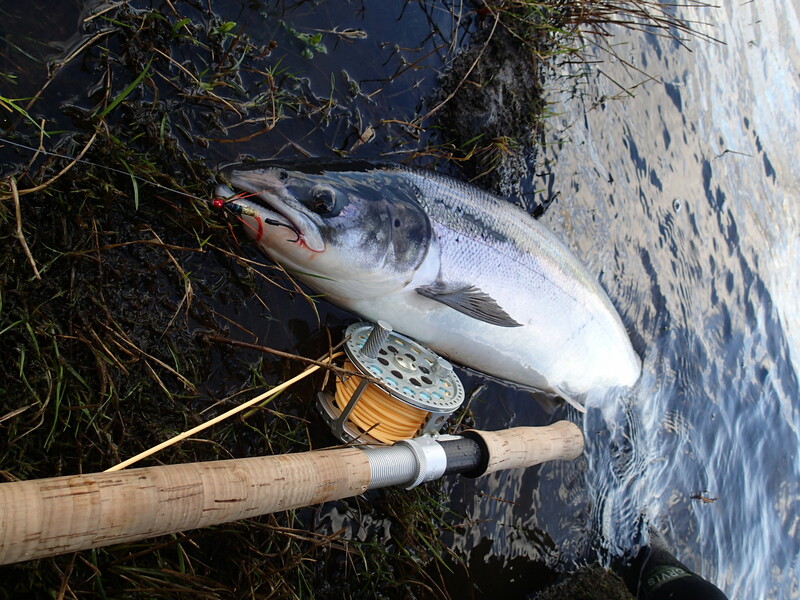 Fantastic fishing beat (One of the best in Scotland in my opinion). Very kind words from Jim, the ghillie in question was my father! I remember! In fact, to encourage you in the sport, I recall giving your father two spinning rods so that you could choose one to keep and return the other. I hope you took up salmon fishing?